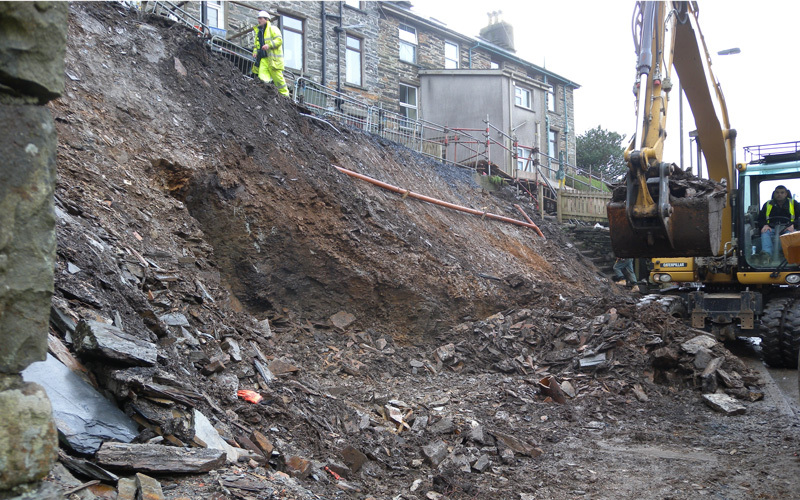 The works involved the replacement of 80 l/m of retaining wall which averaged 3.4m high and retained the 7 houses and gardens of Penbryn Terrace Llan Ffestiniog on the A470. The original wall was constructed of mass gravity dry masonry and was, in some areas, in very poor condition and showing signs of severe deformation and bulging. As a temporary measure steel soldiers and concrete baulks were used to buttress and stabalise the wall. The wall was intersected by 4 stairways which served to provide private accesses to the rear of the properties. In several locations along the wall remnants of old buildings remained and used to be part of the retaining wall but were now redundant and filled with masonry rubble and old domestic scrap. 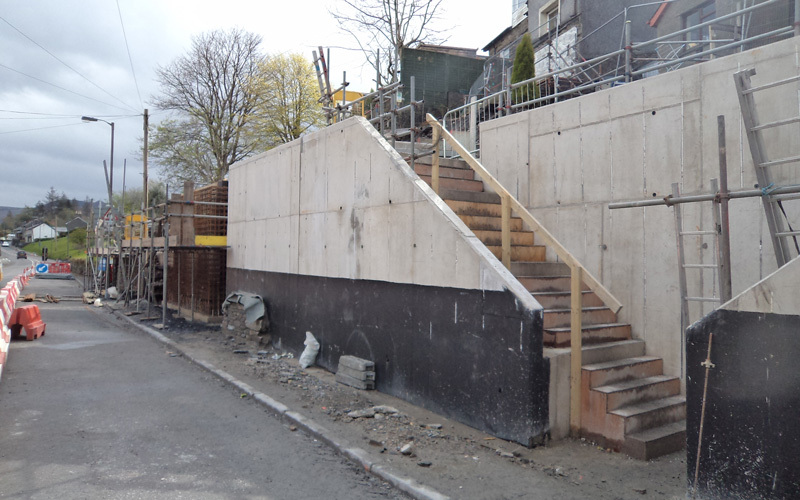 The difficulty with this project was the closeness of the houses to the retaining wall. This would mean that the excavation for the new wall could prove problematic in terms of the need for temporary supports. Extremely thorough Ground Investigation works were undertaken by YGC’s Geotechnical team to ensure that the properties were founded on rock and also to establish where the ‘rock head’ was located. Fortunately all the properties which were close to the earthworks outline (extent of excavation) were founded on solid rock and therefore the design phase could commence. stone. 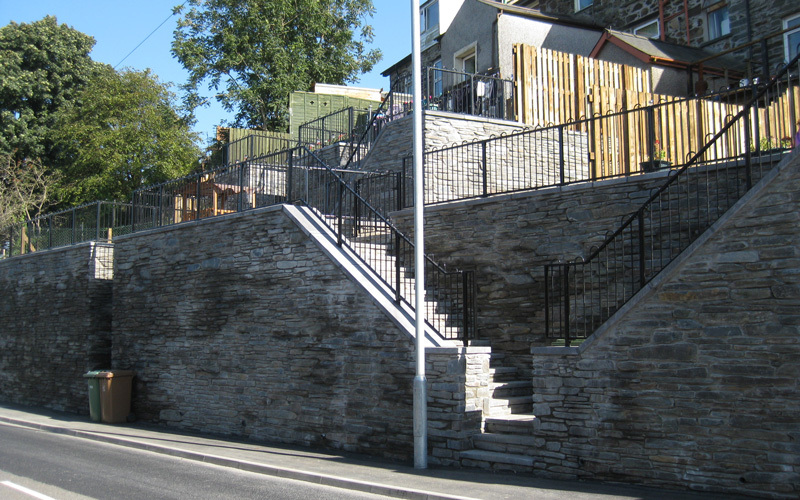 The walls were topped with a slate coloured concrete coping slab and black ‘hooped top’ pedestrian parapet railing. As almost 80% of the gardens were excavated the residents were going to be very restricted during the works. YGC liaised very closely with them and by means of a 3D CAD image of the finished works, were able to reassure the residents of the look of the finished works. During the construction phase temporary water and sewer systems had to be provided as well as a temporary scaffolding ‘fire escape’. Arrangements also had to be made to collect the weekly refuse and recycling. A good relationship was maintained between the YGC teams and the residents throughout the project. The works took 8 moths to complete and the finished walls mimic that of the local style of construction.